From court arrests to workplace raids to the targeting of activists, the Trump administration’s message is clear: no immigrant is off limits to the deportation machine. 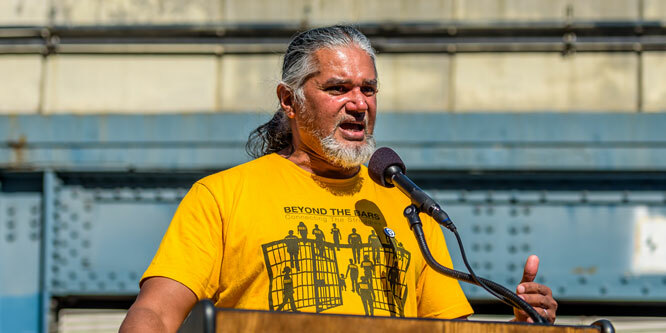 Ravi Ragbir and Juan Hernandez had spent most of the first year of the Trump administration safe from the snares of immigration authorities, living their lives as they had been for years, and considered relatively fortunate compared to countless other migrants who had been rounded up and shunted into deportation proceedings. But their sense of safety was shattered as Trump started year two of his new deportation regime: both men were detained without warning, despite clean records and otherwise “law-abiding” conduct. Their cases show that when it comes to the border, security has a different definition. Standard legal boundaries have now been eclipsed by executive power. At a December press conference, Immigration and Customs Enforcement’s (ICE) interim director Thomas Homann put his mission in brutally stark terms: “The president has made it clear in his executive orders: There’s no population off the table. If you’re in this country illegally, we’re looking for you and we’re going to look to apprehend you.” With open season on immigrants officially declared, the immigration regime has morphed into a bleak new constitutional battleground. “They’ve been laying the groundwork for this for a while. And it’s part of just this really increased in-your-face enforcement that ICE is pursuing,” says Meredith Fortin of the New York Immigration Coalition, which has in recent weeks rallied behind Ragbir, founder of the New York City-based immigrant advocacy group New Sanctuary Coalition. The prominent activist’s sudden arrest in early January signaled that immigration authorities “are very aware of the public perception of their actions,” says Fortin. “They’re very aware of the power of advocacy.” And they are equally aware of the power of silence. Ragbir had every reason to presume he was safe from deportation. Though he had a years-old conviction on his record for wire fraud, he had consistently shown up for his routine check-ins with ICE, generally without incident. But his life was upended in January when he reported to ICE and was jailed and placed in removal proceedings back to his native Trinidad. Although the panic has momentarily lifted since a federal judge ordered his release, Ragbir’s deportation proceedings are far from resolved, and the ongoing dilemma still signals what Fortin calls “a violation of certain norms.” ICE check-ins have generally been seen as “a stressful appointment,” she explains. “But there was an understanding that if they kept their end of the bargaining and dotted all their I’s and cross their T’s and always showed up on time, and particularly if there was potentially an appeal pending,” they would be allowed to return home. Ragbir’s high-profile jailing sent a chilling message to all local immigrant communities—people with or without papers alike: even in a city of immigrants, nowhere is safe. Since President Trump took office, immigration priorities under the Justice Department and its Immigration and Customs Enforcement agency have shifted, or in some cases, disappeared altogether. Advocates say the most dangerous thing about the “new rules” is that there simply are none: arrest can happen anywhere, whether you’re pulled over for a broken taillight on the highway, fighting eviction at your local courtroom, or just showing up for another day at work. Although the administration insists that it has focused its investigations primarily on “individuals who pose a threat to national security, public safety, and border security,” ICE’s pattern of arrests and detentions since Trump took office seems designed to make immigrant communities feel insecure wherever they go. Total arrests have jumped by 40 percent, due largely to a spike in arrests of immigrants without any criminal history. The administration’s insistence that ICE is primarily targeting gang members and drug smugglers just doesn’t square with the numbers, as criminal arrests have dipped sharply as a proportion of overall apprehensions. Attorney General Jeff Sessions now seems bent on clogging immigration courts by moving away from “administrative closure,” the traditional system of triaging dockets so that low-priority deportation orders could be shelved in order to focus resources on higher-priority, typically criminal, cases. This bureaucratic morass makes an immigrant’s legal fate following arrest even more uncertain. Because apprehensions are on overdrive yet cases take longer to process, “people with the strongest cases can be locked up in immigration jails for years fighting for their freedom to remain in the U.S.,” according to Alisa Wellek of Immigrant Defense Project (IDP). In another break from Obama-era policies, ICE has turned its attention to individuals who have overstayed their visas, including students and asylum seekers, many of whom have been living quietly in the United States for years. The agency is reportedly in the process of expanding its dragnet with state-of-the-art data-tracking tools to identify visa overstays for potential deportation. And it’s not just immigration courts subjecting people to deportation; increasingly, ICE’s presence looms even at traffic and family courts. According to IDP, ICE conducted some 139 arrests and attempted arrests at courts in the New York area alone under Trump in 2017. An analysis published by the IDP last fall found that about 10 percent of ICE arrest incidents involved people who actually had legal status. About one fifth had no criminal conviction record, and were simply reporting to routine hearings, over offenses as minor as a traffic ticket—and, worse yet, in cases where they were not the defendant but the victim. One transgender woman was reportedly arrested by ICE last February while reporting to a court building in El Paso, Texas, seeking to process a request for a domestic-violence protective order. The incident spurred fears among advocates that countless other victims of domestic violence would simply calculate that the risk of deportation—and separation from her family—outweighs seeking safety from an abuser. According to a survey published last year by the D.C.-based women’s advocacy group Tahirih, about 40 percent of domestic-violence service providers reported that clients were increasingly reluctant to report violence and abuse due to fear of being exposed to immigration authorities. Even traditional places of charity have been dragged into ICE’s sights. Houses of worship, schools, and homeless shelters—long been deemed “sensitive,” and therefore out of bounds for ICE under previous administrations—are no longer out of bounds. ICE agents reportedly staked out a church in Alexandria, Virginia last February and rounded up several homeless Latino men as they emerged from a shelter in the basement into the biting morning chill. And while several congregations have officially declared themselves “sanctuary” spaces, sheltering immigrants specifically targeted for deportation, little actually keeps ICE from barging through the door beyond administrative discretion. With the collapse of immigration negotiations in the wake of the brief government shutdown, even schools may become a new frontline for ICE enforcement. Unless Congress strikes a separate deal to extend Obama’s DACA program, thousands of young undocumented immigrants will lose their temporary reprieve under the program each month, leaving many to wonder whether their next day in class will be their last in their adopted home country since infancy. Although New York City and many other urban school districts have pledged to keep ICE agents from entering school premises without explicit prior authorization from local education authorities, Fortin worries that many students may still feel unsafe at school because harsh disciplinary policies at some under-resourced institutions could unnecessarily expose kids to arrest for, say, a hallway fight or a suspected “gang affiliation” Immigrant youth of color face over-policing in their neighborhoods and in their schools alike; in some cases, profiling and brutality at the hands of school security officer may only be the beginning of their problems. This has been exemplified by ICE’s targeting of young people in Boston and Long Island, both apparently the result of “guilt by association” through the cross-referencing of criminal databases that disproportionately track black and Latino youth. Therefore, Fortin says, while individual teachers and school officials might in principle pledge to keep ICE from entering schools without prior authorization, those eager to rid their schools of troublemakers might nevertheless be exposing their students to immigration enforcement, whether they realize it or not. Sharing of information across federal databases means that any encounter with police, even without a warrant, can put undocumented youth in the crosshairs of Homeland Security. In Los Angeles, reports have emerged that ICE agents have even disguised themselves as local cops to gain access to people’s homes and workplaces. Last December, the ACLU of Southern California detailed the incident involving a raid of an auto shop by a team of six agents—“carrying semi-automatic weapons and disguised as peace officers—in order to detain and arrest every employee at the garage.” Stalking the parking space with assault rifles, they rounded up and handcuffed several middle-aged men. One of the arrestees, Juan Hernandez, later told the ACLU, “They treated me like a criminal,” noting that he did not even know who had arrested him when he was packed into a nondescript black SUV and sent to a processing center downtown. “They treated me like a person with no rights.” Such treatment should perhaps be unsurprising, however, from an administration that sees Hernandez as exactly that. Had his family not posted $5000 bond for his release, they would have remained separated indefinitely—not by a border, but by the walls of the regional detention facility, Adelanto—one of hundreds of commercially managed ICE detention centers nationwide that warehouse tens of thousands of people every year who would otherwise go on working, attending school, and raising families in their communities as they have for years. Hernandez’s court petition concluded that it is “well settled” in the federal courts that “neither an individual’s apparent race or ethnicity nor his language ability provide reasonable suspicion or probable cause to justify his seizure.” But this logic doesn’t dissuade the White House, which seems to consider nothing off limits, nothing below law enforcement’s dignity, according to civil liberties advocates. When it comes to “securing the border,” everything about our immigration debate has been drastically unsettled—including our consciences.